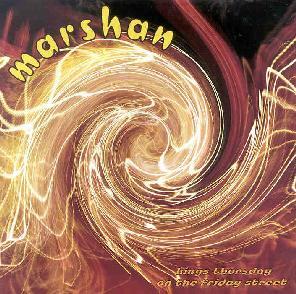 Marshan - "Kings Thursday On The Friday Street"
Hailing from Scotland, Marshan blasts out a swirling windstorm of trippy, kickass stoner rock. The album is short, clocking in at 32 ½-minutes, but the band makes every track count, from the punchy and fabulously titled Purple Demon Blues to the 12-minute long, psychedelically bluesy trip of Needle Eye. In between, we get the percussion driven rocket exhaust of Mutton Chop Hop, the calliope like stepping stone melody of Deep and Meaningless, the intense groove of Funky Fork Song, and the brief but dreamy instrumental, Summer Hill Song. Climb aboard your starship and head for the Marshan homeworld! For more information you can visit the Marshan web site at: http://burieddreams.com/marshan/. Email at: marshans@burieddreams.com. Contact via snail mail c/o Marshan; 17 Falkland Avenue; Newton Mearns; Glasgow; G77 5DR; Scotland.